Fourteen years after the discovery of a large pod of whale sharks or butanding in Donsol, Sorsogon, people around the world continue to troop to this small fishing town in southern Luzon to swim with the whale sharks from December until May. Once an unknown fishing village, Donsol now takes pride in being referred to as the "Whale Shark Capital of the World." The Lonely Planet Guidebook describes the Donsol experience as the "quintessential Philippine adventure." In 2004, Time Magazine called swimming with whale sharks the "Best Animal Encounter in Asia." These accolades ensure the steady arrival of tourists, which has helped transform Donsol from a fourth-class town to a third-class town that houses numerous resorts, dive shops and other businesses. "A lot of people's livelihoods here changed because of the whale sharks," said Omar Nepumuceno, one of the original 28 people trained in 1998 by World Wildlife Fund for Nature Philippines (WWF-Phil) to become butanding interaction officers (BIO). "Aside from my earnings, I am able to make friends with guests all over the world and I am able to further the cause of saving the butanding." For Demetria Aviso, a mother of two who works as a housekeeper in one of the resorts, the presence of the whale sharks has helped alleviate her family's condition, albeit on a seasonal basis. Before the tourism boom, Herrera was a housewife while her husband was a farmer. The money she now earns during the whale shark season not only helps defray the family's day-to-day expenses but also goes into her savings. Whale sharks, known to grow to up to 18 meters long and weigh up to 40 tons, are highly migratory and find a home in Donsol from December until May when planktons, which they feed on, are abundant in the waters of this town. This is the time Donsol comes to life. According to the WWF-Phil, the highest number of whale sharks recorded in a day in Donsol is 18, sighted during the 2009 whale shark season. Since 2007, WWF-Phil has identified 356 whale sharks in Donsol through its photo-identification process. From January to June and November to December last year, 25,174 tourists visited Donsol to see the whale sharks. Of this number, 12,390 were foreigners. 2011 also saw the most number of recorded tours at 5,141, generating almost P6 million in income for Donsol's local government. In 2000, the town recorded only 286 tours. In Donsol, tourists pay P3,500 for a three-hour tour. The amount covers boat rental and fees for the BIO and the spotter, the person assigned to look for the whale shark. Five percent of this amount goes to the local government, along with the registration fees that tourists pay on top of the tour cost. These registration fees are pegged at P100 for Filipino guests and P300 for foreigners. When it started in 1998, tourists could roam the waters of Donsol in search of whale sharks at their own will, but with the arrival of more tourists each year, the Municipal Tourism Center has had to limit the number of hours of interaction. But more than the economic gain that goes with the project, nongovernmental and people's organizations have been organized at the grassroots level, said whale shark researcher Elson Aca. Donsol's Butanding Interaction Officers Association (BOAA), Butanding Boat Operators Association (BBOA) and the Homeowners and Beach Resorts Operators Association regularly meet with the Department of Tourism Region V, Municipal Tourism Office of Donsol and WWF-Phil to discuss problems and improve tourism in Donsol. However, 14 years into its ecotourism industry, the town still faces some of the problems it had in the past. Although Donsol's whale shark tour has improved since its hurried beginning, Aca warned that more than the infrastructural development in the area, Donsol has to strongly enforce tour regulations to continue conserving the whale shark. "The boats are all accredited and they now have a registration center which makes the tours organized in a way. They have an empowered people's organizations and we can see the distribution of income among guides, boat operators and other stakeholders," he said. "But Donsol has to properly, and strictly, implement its interaction policies such as the one boat per one whale shark. 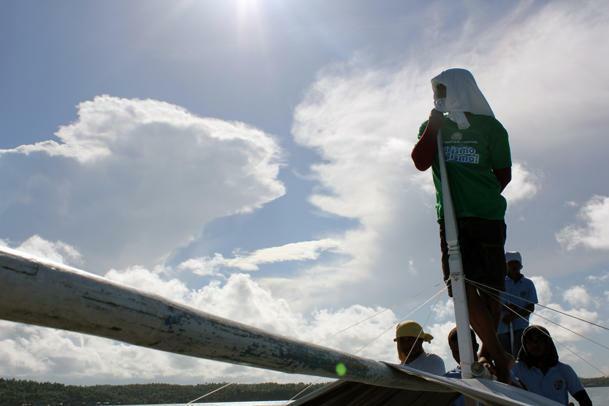 Overcrowding (of boats) is one concern that they have to address in Donsol." Executive Order 23, S-2009 allows only 30 boats to search the waters of Donsol at any given time to avoid crowding of boats and swimmers on whale sharks. The order directs the implementation of the whale shark interaction code of conduct, which includes a maximum of six swimmers per whale shark, only one boat per whale shark, and no touching or riding of whale sharks. But the whale shark interaction code of conduct has been violated time and again. Clara Kerpes, a German traveler who swam with the whale sharks in Donsol in May last year, said that although her group was able to see eight whale sharks in one tour, "it was too crowded." Australian tourist Mervyn Tan, a guest in April last year, said that at one point during the tour, "it felt like a frenzy with many boatloads of tourists fighting to see one single whale shark." Canada's Alastair Hopper, who considers his trip to Donsol to swim with the whale sharks right at the top of the best things he did while in the Philippines for nine months, said the government should "be able to control the tourists who want to see the whale sharks." "A lot of tourists have already expressed concern regarding overcrowding, and they feel that the welfare of the whale sharks is not being prioritized anymore. Some tourists feel that the satisfaction of guests has prevailed over the conservation of the whale sharks. This is a sad thing considering that Donsol started out strongly on the conservation aspect of the program," said Aca. Czech nationals Mark and Agatha, who went to see the whale sharks of Donsol last Jan. 6, admitted that they did not know that the tours have been organized in order to save the whale sharks, noting how the entire tour appeared like a "commercial activity" to them. "It would be nice if the guides could tell us about the history of the program, so we'd also feel strongly about them, that we are also doing something great for the environment," said Agatha. Nepomuceno and Allan Amanse, the country's most experienced BIO, recognize the need to address the issue on overcrowding as it affects everyone involved in the tours, the whale sharks foremost. "If we try to satisfy every tourist who comes here, everyone will be harassed in the process. The BIOs are stressed out having to go on too many tours in a day, the tourists also have to compete among one another, and the whale sharks would have to deal with a lot of this noise," said Amanse. Said Aca: "If you know that there (are) a lot of tourists and the whale sharks are not enough to ensure that the one boat per one whale shark or the six persons per one whale shark rule will be observed, why do you have to keep on arranging trips for that?" He also said the tourism office tends to panic when tourists' demands go out of hand and easily give in even when the office should be in control. Donsol Tourism Officer Nenita Pedragosa, whose office oversees the technical aspect of the whale shark operations, refused to comment on the matter. According to Jayrick Mendiola, one of the tourism office's receptionists, efforts to address overcrowding are taken. He admits that the crowd can really get out of control, especially during Holy Week, Donsol's peak season. Through the initiative of WWF-Phil, a whale shark interaction tour website will be put up by February, so tourists can book and reserve a tour online. "Tourists can check over the Internet the dates in which there are still slots for the whale shark tours. In this way, they can also plan their stay accordingly and avoid coming to town on dates that the tours are already full," said Mendiola. Only half of the total allowed trips in a day can be booked online to accommodate walk-in tourists. But Mendiola was quick to add that the tourism office is also working on improving other attractions in Donsol, so the guests can make good use of their time if they fail to make it to the day's allowed number of trips. Aside from snorkeling with the whale shark, tourists in Donsol can go on a river cruise and firefly-watching tours, as well on an island-hopping trip in nearby Masbate. There is also a backyard tour in one of the villages in Donsol where tourists, especially foreigners, can learn and enjoy how to ride a carabao and dance the Pantomina, a popular Bicol folk dance, among others. Mendiola said the briefing of tourists will also be beefed up this season. The tourism office has assigned an enclosed area to ensure that even when the crowd gets out of hand at the reception area, tourists are assured they know what the tour is all about. "Most of the time, we are fortunate to have guests who understand the entire process and they even come up to us and let us know if there were parts of the interaction that have been violated while they were on tour. Properly briefing them does one part of the job, but the other part of the action is out there in the sea," said Mendiola. He recalls an incident when a guest took a picture of a BIO who not just touched the whale shark, but also tried to carry the whale shark on his back. The tourist reported the incident to the tourism office, which suspended the BIO for five rotations of boat trips. Amanse and Nepomuceno are both aware that there are BIOs who allow their guests to touch the whale sharks, hoping that they would get a bigger tip out of it. "It's sad, but it is true. Everyone here knows it is wrong, but some have simply forgotten what they are here for in the first place," lamented Amanse. Amanse, who headed the Butanding Interaction Officers Association from 1998 to 2010, said his organization is working on self-regulation so it could impose punishment on guests who disregard the rules. Nepomuceno usually punishes guests caught touching the whale shark by bringing them back to the shore, but the tourism office would allow the same guests to take another trip. "That is disappointing on my end, considering that I try to abide by the rules," he said. Mendiola, however, said guests who were reprimanded for touching the whale sharks are only allowed to take on another trip the next day, after they pledge they would no longer touch the whale sharks. The Assessment of the Butanding Interaction Tours Report, a survey conducted by the WWF-Phil among guests who took the whale shark tours last year, shows the ratings of the tourism office, BIOs, boat and crew, and the visitor center, although still good, have dropped. Overall, the rating of Donsol's whale shark tours went from 4.17 in 2010 to 3.80 in 2011. Raul Burce, WWF-Phil program manager in Donsol, said a values formation seminar was conducted last year for the 41 BIOs to remind them the more important responsibility that goes with the job: the protection and conservation of the whale sharks. "Donsol should really be challenged with the presence of the whale sharks in Oslob. They have to be reminded of the reason they have the whale shark interaction tour in the first place. It is really a challenge to Donsol now to properly enforce their laws," said Aca. Max Mutschler, a German tourist who swam with the whale sharks of Donsol in June last year, said he will recommend the tour to his friends if Donsol proves that it is really willing to protect the butanding in the long run. "It is really about time that we go back to ensuring the protection of the whale sharks," said Amanse. "We will put everything to waste if we don't act on it now." (Disclosure: Amor's family owns the Amor Farm Beach Resort in Donsol. VERA Files is put out by veteran journalists taking a deeper look at current issues. VERA is Latin for true).